Today's entry is a short and sad one, as we meet a young lady who lived for only 18 years and suffered from ill health throughout her short life. Despite being born into a royal household, nothing could be done for the unfortunate girl. 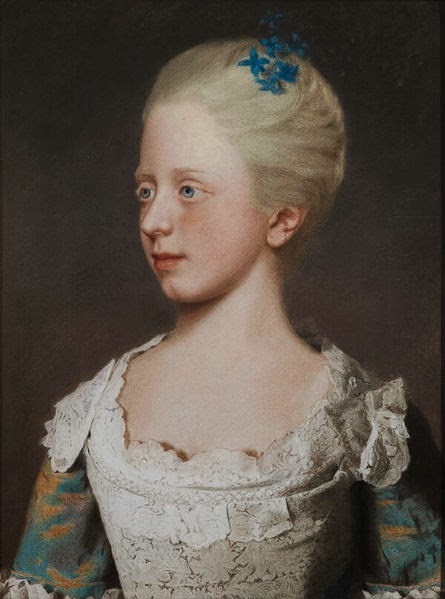 Princess Elizabeth was born at Norfolk House, St James's Square, to Prince Frederick, Prince of Wales, and Princess Augusta of Saxe-Gotha; her grandparents were, of course, King George II and Caroline of Ansbach. The infant princess was christened in the first week of February and was conducted by Thomas Secker, Bishop of Oxford. The little girl suffered from ailments that left her physically weak yet she was a cheery and enthusiastic child, loved by her siblings and keen to take part in their entertainments. However, she was destined to live a short life and at the age of 18 was laid low by an inflammation of the bowels. Within days of falling ill, Princess Elizabeth passed away at Kew Palace. As her family mourned, the unfortunate girl was laid to rest in Westminster Abbey. She looks so proud to be getting her portrait painted! Its strange, but my first thought on seeing the picture was - she doesn't look well! Really? You have a keen eye! I wonder if she had Crohn's. She has that pinched look suffers get and her death sounds very like it. Yes. It sounds like one of those auto immune things. I immediately thought of coeliacs.